TrueBlot® is a secondary antibody that allows detection of molecules with no background in IP and Western Blot. You get high quality blots to present clear results. TrueBlot product line enables researchers to generate publication quality data. 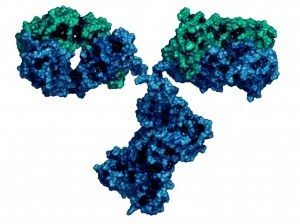 TrueBlot® is a secondary antibody which enables unhindered detection of molecules. Simply substitute your conventional HRP or fluorescent reagent with mouse, rabbit, goat or sheep TrueBlot for unparalleled clarity in results and high quality imaging suitable for reproduction. Available in several options, from IP beads, to complete kits for IP/Western Blot. Immunoprecipitation protocols and Western Blots provide highly specific results, yet often suffer from heavy/light chain blotting, contamination, and ongoing interference. TrueBlot® products solve nearly all of these problems through increased sensitivity, less background noise, and enhanced accuracy. TrueBlot Kits contain critical supporting reagents, buffers and substrates for IP and WB. TrueBlot® Secondary Antibodies in IP–Western Blot Experiments: How do TrueBlot® antibodies work? Ideal for studying post-translational protein modifications, including phosphorylation or protein-protein interactions. The TrueBlot range now includes fluorescent conjugates. Simply substitute your conventional HRP or fluorescent blotting reagent with Mouse, Rabbit or Goat Trueblot.